March 31, 2017 ­­– Washington, DC. Weeks Marine Inc. (WMI), an ENR top 100 construction contractor based in Cranford, NJ, today formally launched the MAGDALEN, a large class, 8,550 cubic yard hopper dredge. After she is fitted out and has completed her sea trials, the MAGDALEN will be WMI’s third hopper dredge. She will be WMI’s largest, fastest, most fuel efficient, most powerful pumping, and most highly automated dredge. She is designed specifically for conditions found offshore of the U.S. coast to meet the unique requirements of the U.S. market. 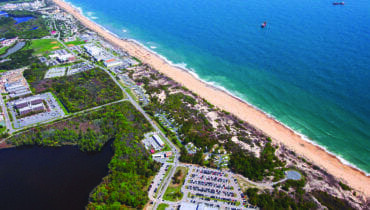 The MAGDALEN doubles WMI’s current hopper dredge capacity, is the capstone of a multi-year Dredging Division investment initiative exceeding $200 million. At more than $110 million, she is the largest single capital investment in the company’s 98-year history. The MAGDALEN’s engineering package was developed jointly by WMI and IHC Merwede. The dredge is equipped with efficient clean burning engines and will feature the latest in world class dredging technology, including state of the art AC drives to power the pumps, jetting and other systems, all of which will be controlled by fully integrated and advanced automated systems. She is 356 feet long and is powered by 13,842 total installed horsepower. Background. Weeks Marine, Inc. is a diversified marine contractor involved in construction, bulk stevedoring, heavy lift, salvage, towing, and dredging. WMI is ranked 96th on ENR’s 2016 top 400 contractors list. With historic roots in the New York Metropolitan Region, WMI was a regional dredging contractor until 1993 when the company purchased American Dredging Company, Camden, NJ, then America’s third largest dredging company. With the American Dredging purchase, WMI acquired the RN Weeks, thus entered the hopper dredging market for the first time. In early 1998, WMI purchased Gulf Coast Trailing from T.L James & Co., acquiring a second hopper dredge, the BE Lindholm. Later that year, WMI purchased most of T.L. James’ remaining marine assets—at the time the second largest U.S. dredging company. The company operates a varied fleet of pipeline dredges to service Corps requirements on the East and Gulf coasts. WMI also operates clamshell/bucket dredges for both the Corps and private terminal clients. Enhancing dredge pump and booster capacity is very important as beneficial uses of dredged material, further and further from the dredge cut, has become the “new norm” in a world where environmental sensitivity and restoration is a sought after societal objective. The MAGDALEN is the latest investment in Weeks multi-year capital program. The private sector hopper dredging industry got its start in the late 1970s. Hopper dredges are self-propelled vessels that excavate material through “drag arms” from the ocean or river floor, pumping the material into the vessel’s “hopper.” They are manned by USCG-licensed seafarers and are used, most critically, to maintain the ocean entrance channels to the nation’s seaports and to restricted naval facilities. The MAGDALEN will be crewed with professional seafarers from the International Organization of Masters Mates & Pilots. As entrance channel hopper dredging was transformed from government-owned, steam powered vessels, to modern private sector diesel electric vessels in the late 1970s and early 1980s, the Corps eventually settled on operating four government hoppers. Two of these are now operated in ready reserve status, as part of the Corps commitment to “using industry first.” Due in large part to this policy, the dredging industry has built four new large-class hopper dredges. The MAGDALEN will be the 15th U.S.-flag hopper dredge in the industry fleet. In recent years, WMI has built a $42 million ocean-going cutter dredge the CR McCaskill, two highly-automated ocean-going boosters, four 7,800 cubic yard hopper barges for long distance hauling, various dump scows, and deck barges and numerous other support vessels. The company has also recently re-powered the 4000-yard hopper dredges BE Lindholm and RN Weeks, cutter suction pipeline dredges Capt. Frank, EW Ellefsen, and RS Weeks, two clamshell/bucket dredges, and an offshore beach unloader.